Atheists, we need to talk. We need to talk about our tendency to think we are better than other people and better than religious people in particular. We need to talk about how we think that religion is the reason that bad things happen in the world. We need to talk about our culture of turning a blind eye towards the despicable behavior we see among ourselves. All of those things we do are exactly the problem with the religious institutions we hate: tribalism at the cost of morality. Reason without decency is useless. If it’s unreasonable for the pope to hide rapists, why do we accept it from our organizations? If it’s unreasonable for the Catholic Church to trivialize child molestation, why do we accept it from our supposed leaders? If we don’t like Christian politicians peddling untrue stereotypes of Muslims, why are we ok with it when it comes from bestselling atheist authors? Atheists heal thyself. There is anger and fear from atheists today upon the revelation that the most recent of the mass shooters in America was a non-believer who targeted Christians. They will blame us, they will think this is all atheists, they will think we are all the same as him. Hitchens was wrong. Human institutions and tribalism poison everything, regardless of creed, and atheism is no different. 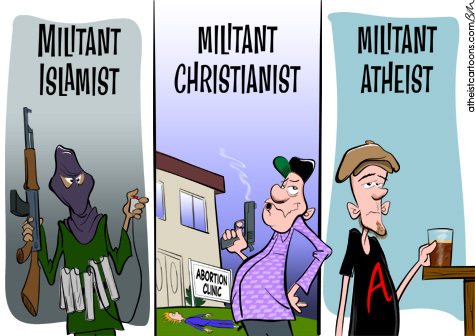 Radical atheists who want to kill people are not different from radical Christians and Muslims doing the same thing. This is not the first atheist shooter, there have been many throughout history. Earlier this year, Craig Hicks took the lives of three brilliant humanitarian Muslims over a parking dispute. Atheists tried to distance themselves and label him as “anti-theist” and others thought he was secretly really a Christian. Still others labeled him as a redneck from NRA-land, because hatred of the ignorant South is acceptable among educated atheists. I am sure atheists will be eager to point out that the current shooter was a Republican and No True Atheist. I don’t know enough about the current shooter to say. But Craig Hicks was a typical atheist until he pulled the trigger. He was friends with a lot of atheists on Facebook, we had many mutual friends. If you went through his Facebook feed, he did not come off as an Islamophobe or a racist or someone likely to go on a shooting spree. The guy acted like literally hundreds of atheists I know on Facebook. The majority of his posts were reposting things from George Takei. He was friends with feminist activists. He hated right-wingers and country music, but loved Obamacare. He was one of us. So was the shooter yesterday. I want us not to flinch away from that fact, because it’s not useful to us to ignore it. Stop with your buts and your wells and whatever you want to add, just sit with it and live with it for a minute. Let it make you uncomfortable. Atheism can motivate terrible crimes, just like religion can. This is a thing we have to get used to. Atheists are so used to being exceptional, to being smarter and less criminal than other Americans, that the fact that someone was an atheist and did a bad thing seems to be exceedingly difficult for us to understand. Atheist exceptionalism cannot survive the exponential growth of atheism — all atheists are not better than all religious people. Furthermore, the atheist community is culpable of spreading bad ideas. We share memes and the belief that religious people are bad and that all religions and expressions of those religions are bad. That people who are religious aren’t worthwhile and are certainly too stupid to be respected. We dehumanize people who disagree with us instead of arguing about ideas. This is because we are human, but we have to guard against. Atheism itself doesn’t create these ideas, but atheist culture does — just like religions don’t encourage the bombing of abortion clinics, but some religious culture does. My article, “The Non-Religious Patriarchy,” delved into why removing religion did not remove sexism from the atheist movement, but we have to remember that removing religion is not going to remove any basic human behavior or system of power. Humans are tribal, humans are sometimes sociopaths, humans are power-hungry, humans get angry. The atheist demographic being dominated by young white men means that it’s not surprising that there are mass shooters who are atheists, shooters are predominately young white men (the Oregon shooter was mixed race). Atheism is a rejection of a belief, but it is not a philosophy or creed. The atheist community online builds up creeds and philosophies in light of that absence. It is reactionary. Many of us have come from environments that were hostile to our non-belief and so we respond with hostility to the kind of beliefs and people who were responsible for our unhappiness. We, like nerds have always done, take refuge in our intellectual superiority to salve wounds of rejection and, in doing so, think other people are less worthy than we are. We have to let it go. We have to stop thinking we are better than other people just because we know something they don’t — that’s exactly why religious people act the way they do. We aren’t better than anybody and we never were. See this from Libby Anne for more on Atheist Tribalism.